This smoothie is loaded with nutrition from a variety of ingredients with their own unique health promoting properties. To avoid writing a novel only the two main ingredients, pineapple and chlorella, are profiled. The other ingredients are covered in previous recipes and articles. Pineapples are rich in vitamin C and manganese, and a good source of dietary fiber, folate, copper, vitamin B1, and vitamin B6. This nutrient profile promotes the following health benefits: anti-inflammatory, antioxidant activity, digestive aid, immune support, and protection against macular degeneration. One cup of pineapple has a mere 82 calories. Chlorella is a nutritional superstar primarily because of its chlorophyll content. The chlorophyll helps the body process more oxygen, helps cleanse the blood, and promotes tissue growth and repair. Through the process of chelation, chlorella helps detoxify heavy metals by binding to and ushering these bad guys out of the body. 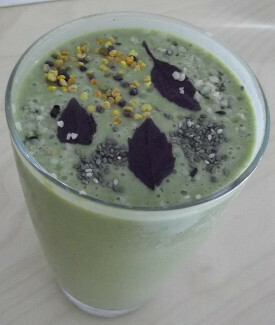 This is the second recipe that was gifted to me by fellow smoothie enthusiast Ana. Thanks, Ana! Connecting and sharing recipes with people from around the world has proven to be most rewarding. If you have a unique or stellar recipe you think others would enjoy please email me and I’ll most likely share it. If you don’t have coconut water, regular water or milk will do just fine. The squeeze of lemon really did put this over the top. Enjoy! Ana and I would love to know if you try this pineapple chlorella smoothie – please leave a comment below. Happy Blending! And anything else I need? Yes, I’m new to this. Good question. All of the superfoods you listed below do have relatively long shelf lives – 6 to 12 months. Chia seeds even longer. If you’re new to this I would start with two of the items you listed, such as chia seeds and cacao. See how you like those and then look to incorporate some of the others into the mix. Why is my green smoothie brown?????? I made this smoothie today and it was so creamy because of the avocado. I did it without the bee pollen. And from the Add-ons ingredients, I only used the shredded coconut. I used goat’s milk yogurt and sweetened the smoothie with enough stevia to create the sweet and sour flavor with the lemon. It was delicious and healthy. Thanks for sharing. Avocado does lend a beautiful creaminess to smoothies. Thanks for sharing your version of this recipe, SM, sounds delicious! What other base can I substitute coconut water with?